The International Costa Maya Festival is always a favorite on Ambergris Caye.Â The festival brings together Central American countries in Belize for a week of music concerts, dances, cultural presentations and an international Latin beauty pageant. The festival has garnered international attention over the years. This year was a landmark, since itÂs the 20th year since the festivalÂs inception. The first festival was established 20 years ago. Initially the intent was to increase the islandÂs tourism during the typically slow late summer month.Â The festival itself is a Central American event designed to celebrate the Mayan and Central American Latino cultures of the region. )Â This year IÂll describe the various activities that took place over a weekÂs period.Â Â They included comedy, music concerts, dance performances, cultural presentations and a popular international beauty pageant. 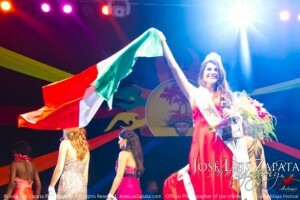 A key attraction of the festival is the Reina de la Costa Maya beauty pageant. Â Beauty pageants are ingrained in the Latin culture, as femininity reigns supreme.Â But on Ambergris Caye, this is much more than a one day affair.Â The pageant involves a full week of activities that involve the beauty contestants. The beauty queens all arrived a week before the pageant, on July 28th.Â They were introduced to the community the first night at a welcome dinner, held at FidoÂs.Â That allowed the islandÂs residents to intermingle with the lovely Latin ladies, and get to meet them in person. The first formal night in town was the Noche Tropical event, held at RamÃ³nÂs on Saturday, July 30th.Â Â The contestants first participated in a fashion show.Â As is the norm, they modeled clothes from popular local boutiques. They later showcased cultural attire/costumes from their home countries of Mexico, El Salvador, Guatemala, Nicaragua, Panama, Costa Rica, Honduras, and Belize. The contestants spent an entire week participating in activities around San Pedro Town.Â So the residents of San Pedro had plenty of opportunity to decide who they thought deserved to win the Costa Maya title.Â There was plenty of buzz and debate around town about the beauty, personality and charms of each contestant. The lovely ladies spent much of the week fulfilling their duties as beauty Ambassadors for their respective countries.Â They participated in a series of activities and photo shoots.Â These shoots were held in both natural and business settings on the island and the mainland.Â Of course, they had plenty of opportunities to enjoy themselves and experience the wonders of Belize. After the weekend, the ladies focused on preparing for the Friday night pageant.Â But they were still spotted around town at restaurants, boutiques and gift shops that had sponsored the event. Â It was not unusual to bump into the group in town, as they floated from one photo opportunity to another. After a week of anticipation, the beauty pageant was held on Friday night, at Saca Chispas Field.Â As usual, the pageant was vibrant, colorful and creative.Â There was plenty of glamorous attire, lively music, dance performances, and culturally inspired costumes. The cultural costumes are quite different from other beauty pageants.Â They are designed to capture the spirit of each regional country.Â Of course, the swimsuit, and sensual evening gown competitions are always stand outs. The fist runner up isÂ Miss Nicaragua Gisselle de los Angeles Alvarez Ramirez and second runner up is Miss Honduras Linda Beatrice Kennett. Heaven only knows what the 2012 Costa Maya Festival will bring!